Let me tell you that Thailand is worth all of the type. I may be biased because Thailand is one of my favourite countries in the world. 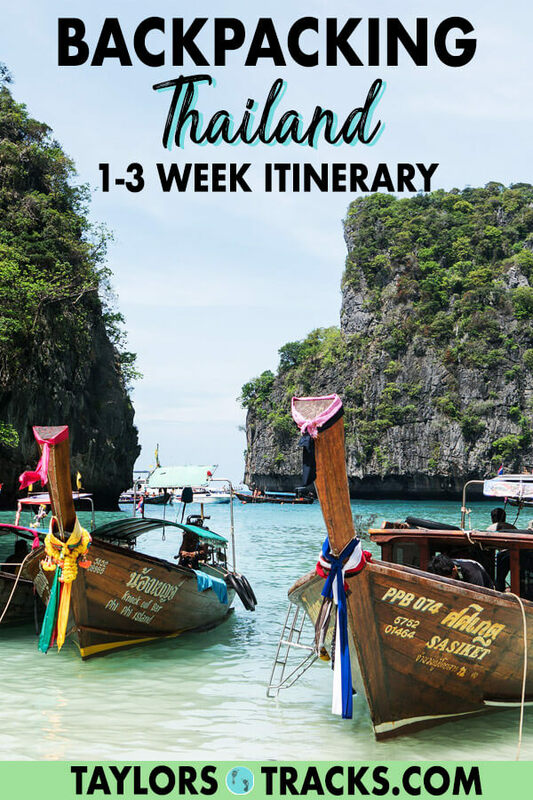 Most people who visit will agree with me that it is an incredible country and planning a trip to Thailand is almost as fun as going on your Thailand trip (okay, maybe that’s just people who like to plan!). The food is more than delicious, the people are as friendly as people say they are and the pictures you’ve seen online, well, they’re even better in person. 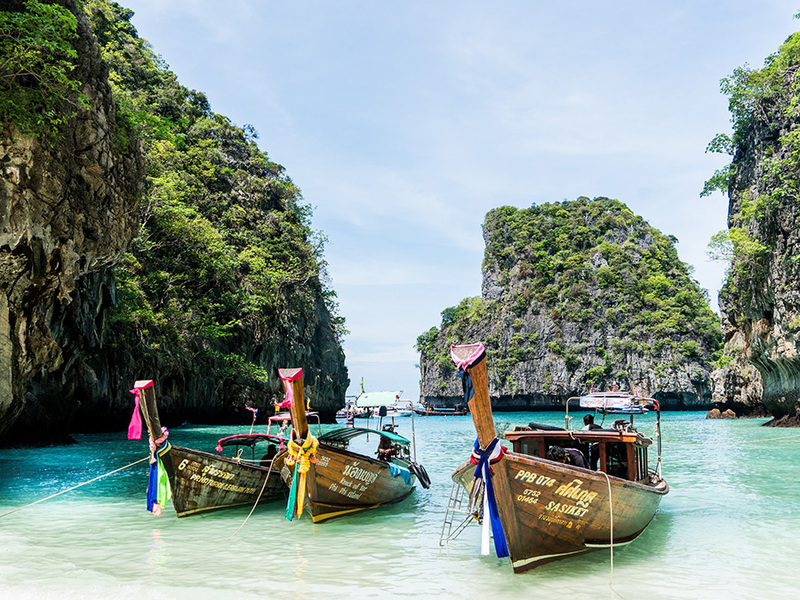 From the mountains in the north to the islands in the south and the mega-city of Bangkok in the middle, Thailand is a country full of diverse landscapes, every flavour of food and surprises around every corner. Plus there are so many things to do in Thailand. Your dollar with stretch far, you will be continually entertained and you will gaze in amazement pretty much around every corner. But enough of me talking about how great Thailand is, let me tell you how to plan a trip to Thailand and exactly what to do in Thailand. 9 How Long to Spend in Thailand? The good news is that Thailand can be visited year-round with favourable weather most of the year. The thing to keep in mind is that the weather varies depending on the region with three seasons: hot, cool and wet. 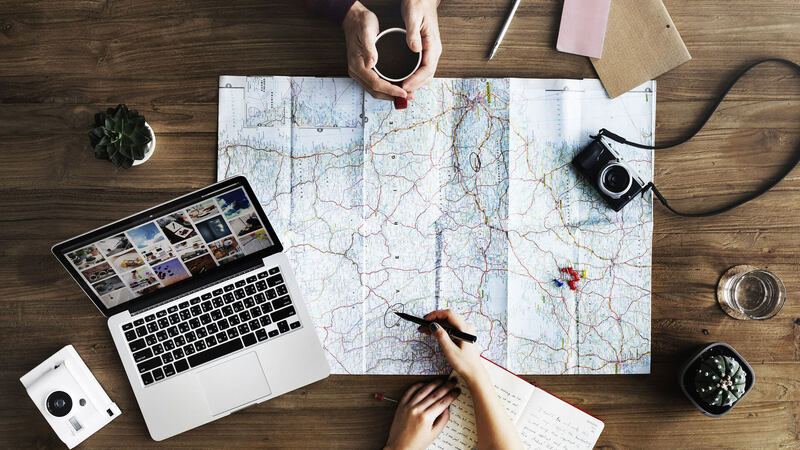 Generally the best time of year to visit for weather is November-February but this is also when the country sees the most tourists so prices spike and accommodation needs to be booked further in advance. Hot season in central Thailand (Bangkok) is February-June while Northern Thailand (Chiang Mai, Pai, Chiang Rai) experiences a shorter hot season from February-April. Central Thailand’s rainy season is June-October and Northern Thailand’s is May-September. The islands have different weather at different times of the year depending on the coast with only two seasons: wet or dry. You will want to visit the islands in the Gulf of Thailand (Koh Tao, Koh Phangan, Koh Samui) in the dry season, January-August, and the islands on the Andaman Coast (Phuket, Krabi, Phi Phi) in their dry season, November to March. So really the best time to visit is in November and February, the shoulder seasons to experience the best weather anywhere in Thailand and not have as many crowds. For up to date conversions check XE Currency. Thailand is an excellent destination to visit for any budget. From budget to luxury accommodation, cheap day trips and tuk-tuk rides to high-end shuttles and resorts, you can easily adjust your budget to your lifestyle in Thailand. Backpackers can get away with spending as low as $25USD (820 baht) including food, accommodation, alcohol and activities. Of course, this budget comes with some limiting. 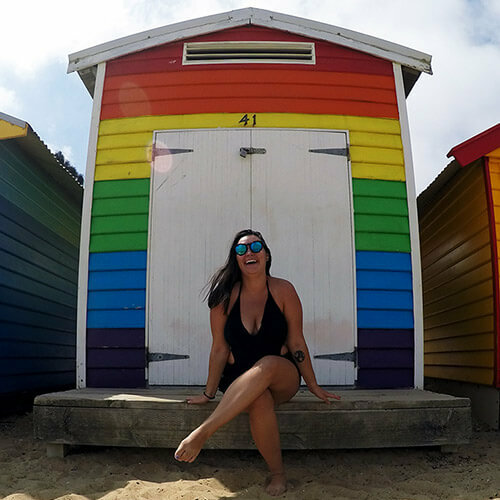 On $25USD a day you can stay in hostels, eat street food, have nights out a couple of times a week and splurge on full-day tours every so often and take buses or budget trains as transport. I recommend adding $10-15USD (330-500 baht) per day to your budget for each day you are spending on an island as the islands are the most pricey. For a mid-range budget of $50USD (1,660 baht) a day will get you dorm rooms with A/C (sometimes even a private room! ), will be able to eat out at restaurants, book more expensive activities and have the option to fly between Thailand destinations. If you have a budget of $100USD (3,300 baht) a day or more than you’re living a life of luxury in Thailand. You can even find resorts for $1000USD a night in Thailand so it’s really up to you and how much you want to spoil yourself! Thailand is one of the easiest countries to get to in Southeast Asia and that’s mainly because Bangkok is a major hub for the region. If coming into Thailand by land you can look at bus options from Cambodia, Laos and Myanmar using 12Go to get an idea on prices, routes and distances. If travelling into Thailand from Laos I recommend taking the 2 day boat journey down the Mekong from Luang Prabang. Thailand travel can sometimes be chaotic, but always fun! 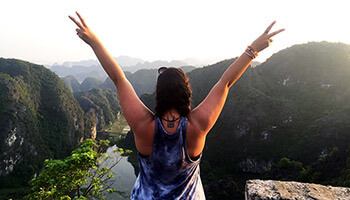 Thailand travel can not be explained in one easy answer because depending on where you’re travelling to and from will determine how you can get around Thailand. Flights between major cities such as Bangkok, Chiang Mai and larger islands such as Phuket and Koh Samui are possible. Otherwise most land travel in Thailand is via bus or trains. To get around the islands there is a good ferry schedule and even if you’re travelling to islands far apart you can book bus/train and ferries together to make it simple and easy for you to book. I highly recommend booking transportation through 12Go as it is the largest and most trusted company for transport throughout Southeast Asia for bus, trains, ferries, transfers and flights. Activated Charcoal: When your tummy is not feeling so great and you may need to run to the bathroom at any second you’ll be happy this within arms reach. Food and stomach issues are common in Thailand and these will help you get back to health and enjoying your vacay in no time. This is an overview of the places to visit in Thailand that you can add to your Thailand trip itinerary. More detailed descriptions and the general vibe of each place is below which will help you pick out places for your Thailand travel plan. Keep in mind that the best places to go to in Thailand are really determined on what you like as a traveller. 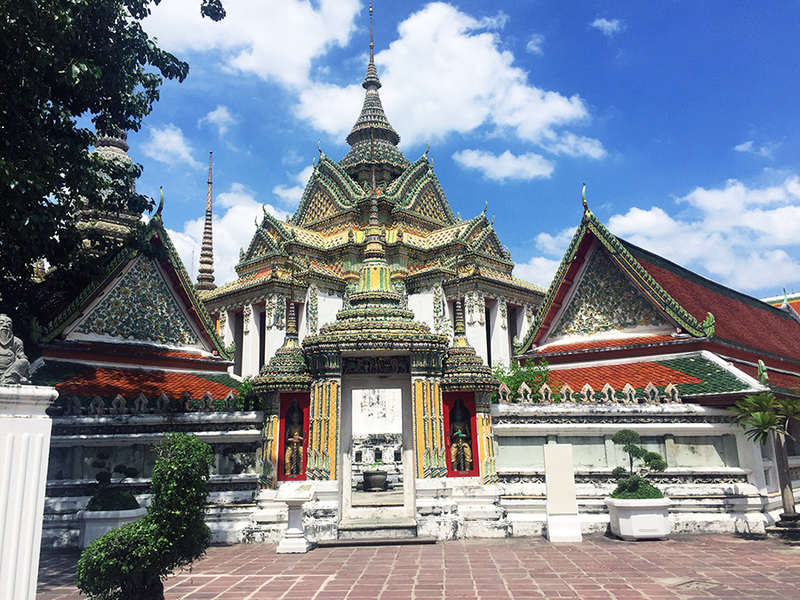 Bangkok: Bangkok is the major hub of Thailand, the beating core of the country and it’s here that you will find the most hectic mix of markets, temples, busy streets and shopping malls. Bangkok is a very westernized city but not to the point that it doesn’t feel exotic. Ayutthaya: Ayutthaya is just north of Bangkok but you could spend time here if history is your calling. Ayutthaya was once the capital of the Kingdom of Siam but today it is filled with ruins of the past after it was attacked by the Burmese. Chiang Mai: Chiang Mai is another big city but nothing like Bangkok. While things are still hectic (it is Southeast Asia! ), Chiang Mai is more relaxed. There is a large expat and digital nomad community here as its cheap, there are many night markets and delicious food. Stop in Chiang Mai is you like being in the city but having nature right on your doorstep. Pai: Pai is a bit of a hippie village in northern Thailand that was first visited by backpackers. Today, it’s still popular with backpackers but it’s definitely getting busier. The hippie and relaxed vibes are still present though with bars playing chill music with cushions to sit on the ground, one main street with a market and quiet nature surrounding the town in the mountains. Chiang Rai: Chiang Rai is most known for the famous white temple. There isn’t too much here other than a few museums but it’s great if you want a city that is quieter. It’s also a great jumping off point to Laos and Myanmar as it’s close to both borders. Any northern Thailand itinerary should include Chiang Mai. Koh Tao: Koh Tao is a small island that is very relaxed. Here you’ll be able to party the night away and be close to all of the action or be in your own private cove in a bungalow. The joy of this island is that it appeals to many kinds of travellers. It’s the perfect place to chill out and is famous for some of the cheapest diving courses in the world. Koh Phangan: Koh Phangan is the island next to Koh Tao and is larger, known for Thailand’s famous full moon parties. Even if you’re not here for the full moon you will have another party to attend. That being said, it is possible to get away from the party scene. Yoga retreats are available on the island. 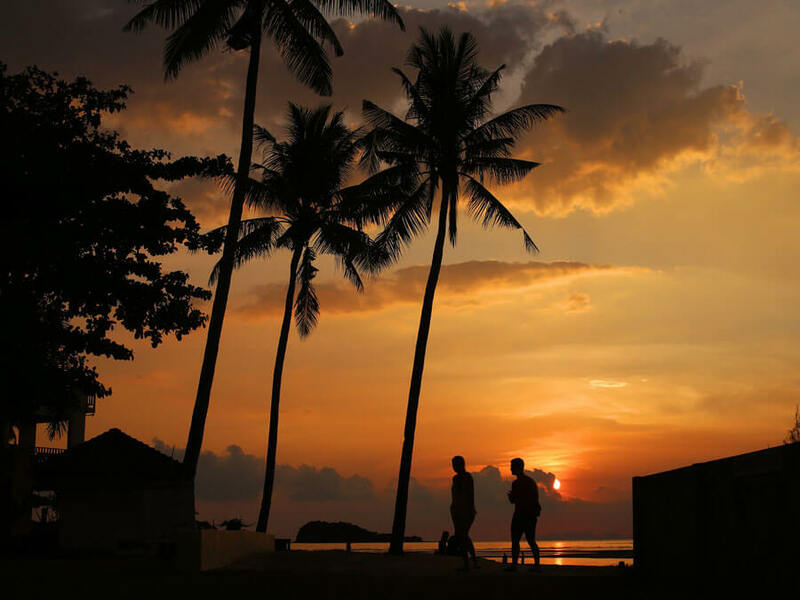 Koh Samui: Koh Samui is next to Koh Phangan and is known as a family-friendly island. It’s Thailand second largest island so you will need transportation to get around. Large luxurious resorts, yoga retreats and beaches with palm trees dot around the island. A big draw to Koh Samui is that it has an airport so it’s easy to get to. Koh Chang: Koh Chang is for those who want to get off the beaten path. It requires a 5-hour drive from Bangkok which many choose to make but not nearly as many visit Koh Chang as the other islands. What people love about Koh Chang is the nature with lots of dense jungle, a national park and secluded Thailand beaches. Best Thailand destinations: the islands, of course! Phuket: Phuket is Thailand’s largest and most commonly visited island. The biggest bonus on this island is that is has an airport and it has something for everyone. Backpackers, families and luxury travellers can find accommodation here. There’s plenty of space to find quiet beaches but you will have to travel further as it is a popular island to visit. Shopping, entertainment, culture and markets are here. 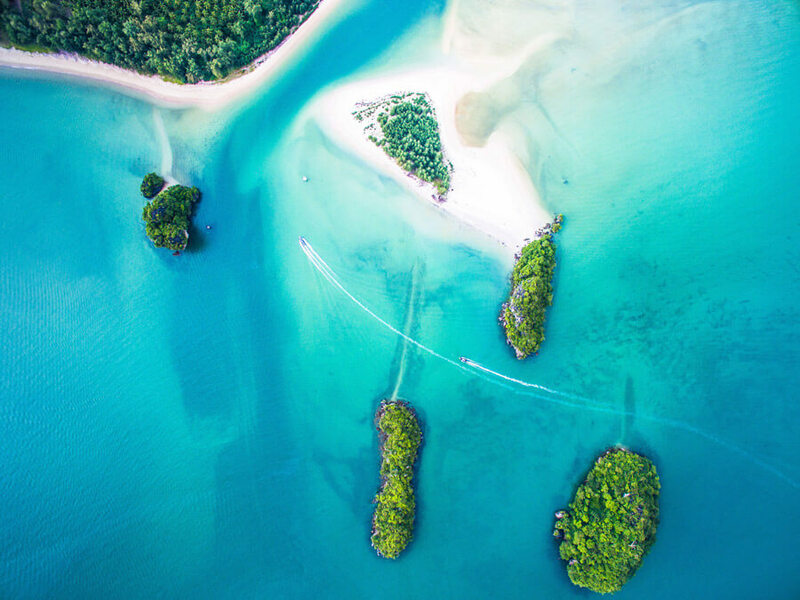 Krabi: Though not an island, many travellers opt to travel to Krabi instead of Phuket for fewer crowds in this province. The area is stunning with towering limestone cliffs, many islands off the coast, rainforests and the famous places such as Railay and Tonsai. Phi Phi Islands: The Phi Phi Islands are among the most well-known islands in all of Thailand. They are part of Krabi Province, just south of Phuket and popular for day trips. Phi Phi Don is the most popular and it has no roads and a totally laid-back vibe. Koh Lanta: Koh Lanta is too apart of the Krabi Province and is home to a group of 52 islands, Koh Lanta Lai being the most popular. It attracts visitors because it is less visited with pristine resorts and stunning natural scenery with jungle, coral reefs and crystal clear waters. How Long to Spend in Thailand? Generally, most people spend two weeks in Thailand which gives you the chance to see the central and northern Thailand along with one or two islands. Travelling Thailand can be done in a week but I would recommend visiting only one or two islands, two cities or one city and one island. Three weeks in Thailand would be ideal and you could for sure spend longer if you so desired (seriously I would stay that long for the food alone). 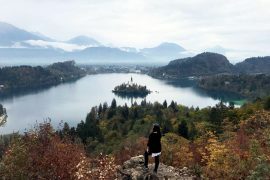 You really need to read through this whole article to pick your itinerary, I can’t make it for you because where you go in Thailand really depends on what you’re looking for. The islands are obviously more laid-back, some are quieter, some are known for their parties. The north is totally different compared to central Thailand and then different spots in the north appeal to different travellers. If there’s one place I think everyone should go to it’s Bangkok! 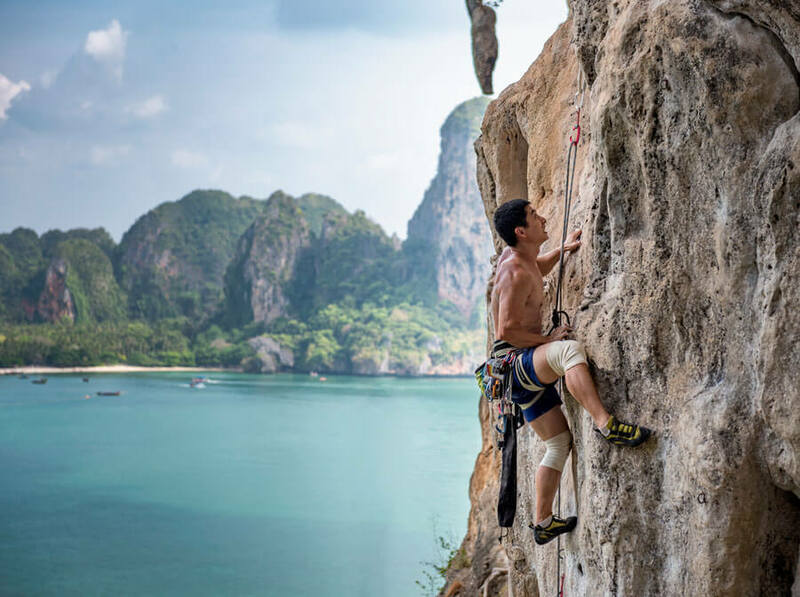 These sample Thailand itineraries will give you a general idea of what you can cover in each time period that you have for travel to help you create the best Thailand vacation itinerary possible. 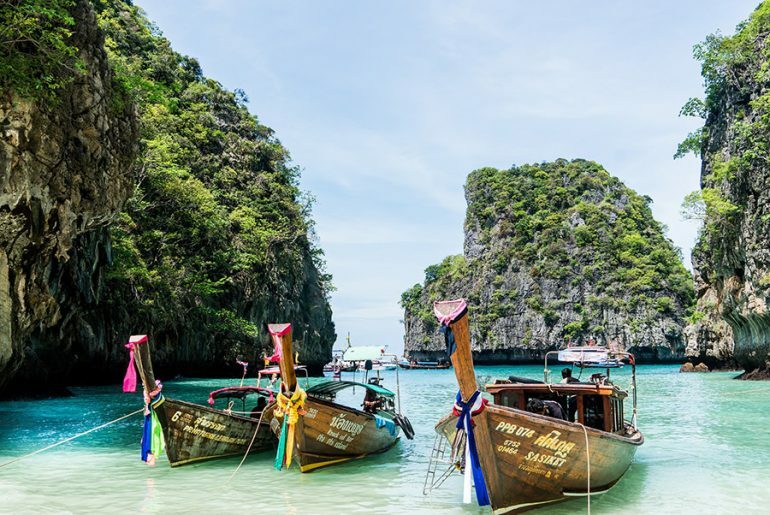 Bangkok is listed in all of them but if you’re solely doing islands it’s possible to fly direct to Phuket to jump off to the Andaman coast islands. Interesting places to visit in Thailand always include Bangkok. 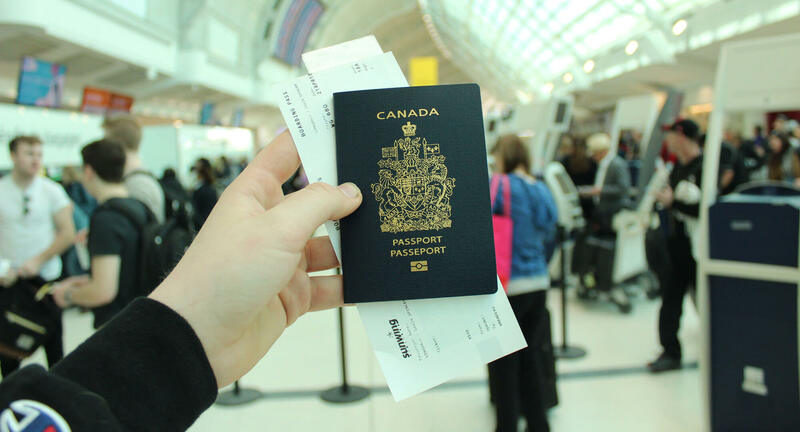 Without a doubt, you will fly into Bangkok and it’s a wonderful place to get yourself settled in Thailand. You’ll be thrown in head first, but not to worry, Bangkok is a world class city and though many things will be different it is the perfect starting point. DAY ONE: Many international flights land late at night so chances are you’ll get to your accommodation and pass out. Get a good rest and on your first day, you can tackle some of Bangkok’s best attractions. Head over to the Grand Palace, the earlier the better as lines get long. From here you can tackle Wat Po which houses a giant reclining Buddha and Wat Arun. 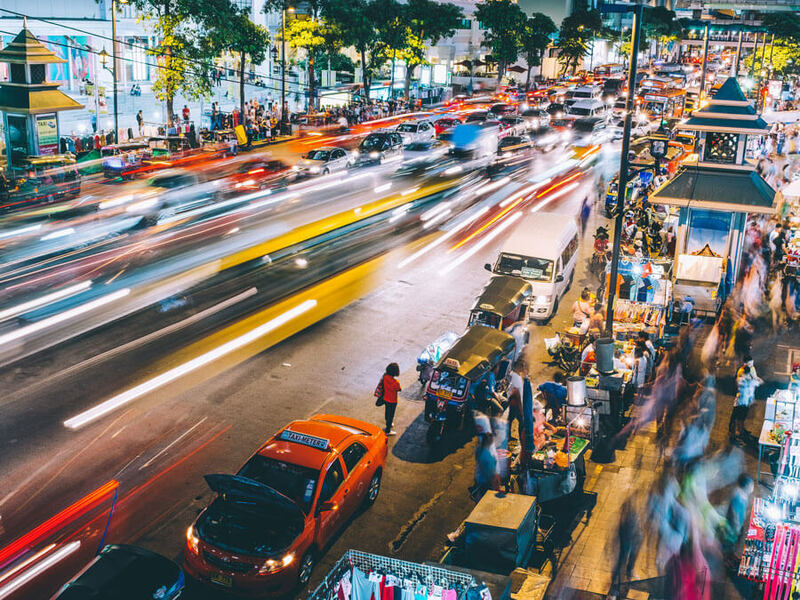 Spend the evening around Khao San Road, the famous party street where you can grab a bite to eat, get a message if you’re tired, shop or party the night away. Pro Tip: Wat means temple in Thai, expect to see it a lot! DAY TWO: Get ready to shop…if you’re in Bangkok on a weekend you can not miss Chatuchak Market where you can find just about everything from clothes, to souvenirs and food. If you’re in Bangkok on a weekday there are plenty of other markets to see and even more malls. In the afternoon get yourself to a Muay Thai fight at one of the two stadiums in the city, Ratchadamnoen or Lumpini. For the evening head up to one of many rooftop bars. The most famous are Sky Bar and Octave Rooftop Lounge & Bar. DAY THREE: A trip to Thailand is not complete without seeing one of the floating markets. It’s a unique experience and lets you just chill out for the morning or afternoon! All of the floating markets are outside the city so prepare for a day trip. My personal recommendation is the Damnoen Saduak Floating Market. It is the largest and one of the oldest in Bangkok. You’ll find food, animals and lots of other goodies! How to get from Bangkok to Chiang Mai. A Thailand tour itinerary is not complete without Chiang Mai. Chiang Mai is going to steal your heart. There’s a reason why so many expats live in this city. The Old City is filled with historic temples and trendy cafes. 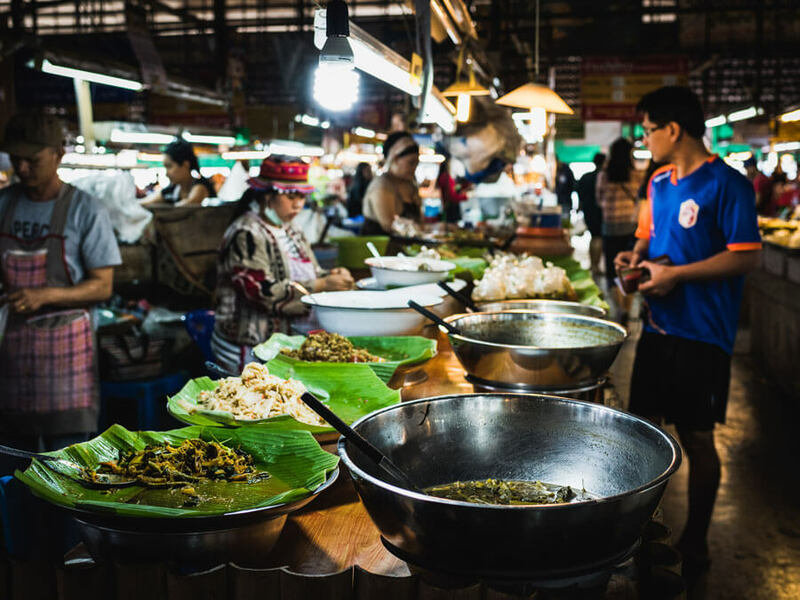 The markets are some of the best in Thailand, you’ll find some of the top Thai dishes here and nature is so close to the city. DAY ONE: Get yourself aquainted with Chiang Mai. Rent a scooter and explore the Old Ciy temple hopping. Head up to Wat Phra That Doi Suthep and get ready to climb the 300 stairs up. I promise it’s worth it. Recover from your travels with a Thai massage or hangout at one of the local cafes. If you’re up for it make your way to Zoe in Yellow, one of the top clubs in Chiang Mai where you can find an abundance of other clubs and bars in the open air court yard. DAY TWO: Recover from your hangover by cooking some of the tastiest Thai food you’ll ever try. One of the best things to do in Thailand is a cooking class in Chiang Mai. Full and half day classes and market visits are available (I did the half day and didn’t think I’d be able to walk the rest of the day because there’s so much food!). Spend your evening at Chiang Mai’s best market, the Night Bazaar where you can shop your heart out and eat local favourites from the abundance of street food stalls with live music. 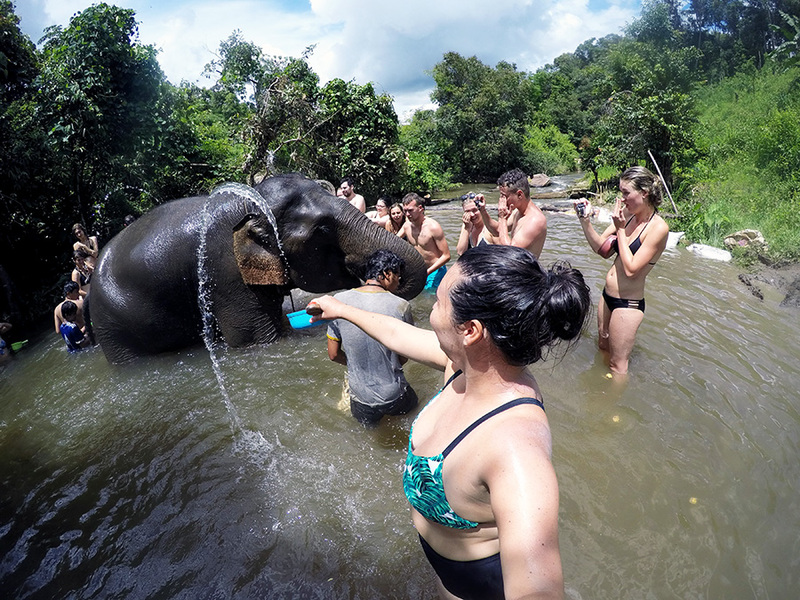 DAY THREE: Get up close to elephants at Elephant Nature Park. Spend the day feeding, bathing and playing with these friendly giants. For evening entertainment make sure you don’t miss one of Thailand’s best lady boy shows at the Chiang Mai Cabaret Show. It’s the exact show that was aired on Anthony Bourdain’s Parts Unknown episode from Chiang Mai! Pro tip: Do not ride elephants! If a place supports riding elephants I would avoid going there. Elephant Nature Park is an ethical choice. DAY FOUR: Time for a day trip! One option is to hire a scooter for the day and check out the Chiang Mai Grand Canyon where you can relax on floating bamboo rafts and jump from the cliff (don’t do it with your GoPro, I saw 5 people lose theirs!). Another option is go zipling through the lush tropical forest. Or a third option is to Doi Inthanon National Park for some hiking. How to get from Chiang Mai to Pai. I encourage you to include Pai in your Thailand travel itinerary. Pai is a little town in northern Thailand nestled in the mountains known for its hippie vibes. Think tie die clothing, handmade jewelry and small carts selling treats at the market. If you love nature and just want to hangout for a few days, Pai is the perfect place for you. But don’t worry there is still plenty to do. DAY ONE: You’ll spend half of your day on a bus but don’t worry because you’ll be rewarded with plenty of awesome and hip little cafes where you can spend your afternoon relaxing. Better yet, find a hammock! Or you can swing by the Pai Circus School. It’s a hostel so you can stay there. It has a pool and stunning views over the rolling green hills and yes you can actually learn some circus tricks! DAY TWO: Get ready for a day packed with adventure! Rent yourself a scooter and head out to some of Pai’s best spots. Check out the top waterfalls, Pombok Waterfall and Mo Paeng Waterfalls. Take a quick stop at the Land Crack where you can see the land literally split. Spend the afternoon hanging out at the Tha Pai Hot Springs and to cap off your perfect day watch sunset at Pai Canyon. DAY THREE: Rent a scooter and take a day trip to Lod Cave. It’s 35km outside of Pai but it makes for a beautiful drive through up and down a mountain. The cave itself has a river running through it and it’s incredible to see in person. Spend the night along Walking Street or in one of the laid-back bars that have cushions to relax on while you drink. How to get from Pai to Chiang Rai. 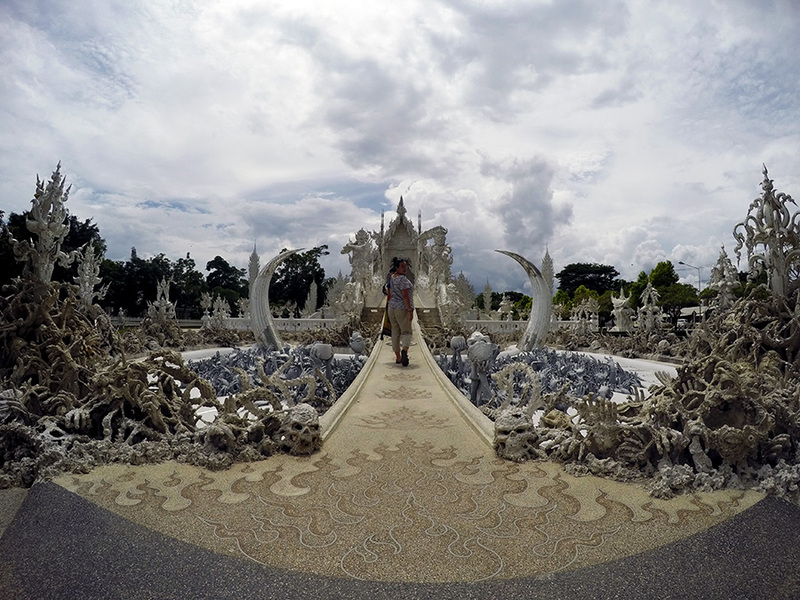 The White Temple in Chiang Mai is absolutely incredible! DAY ONE: This can be done as a day trip from Pai or Chiang Mai. Either way, it is a must-do. The famous White Temple is reason enough to go. It’s a bucket list item in Thailand and you won’t regret it even if it is one of the top tourist places in Thailand. If you end up staying overnight head to the Chiang Rai night market for yummy food and a ton of shopping. This is also a great jumping off spot to get into Laos if you’re heading to more than just Thailand in Southeast Asia! I recommend getting back to Bangkok and researching travel options to the islands from Bangkok as it will be cheapest. How to get from Bangkok to Koh Tao (the closest island). Where to visit in Thailand: Freedom Beach Viewpoint on Koh Tao. 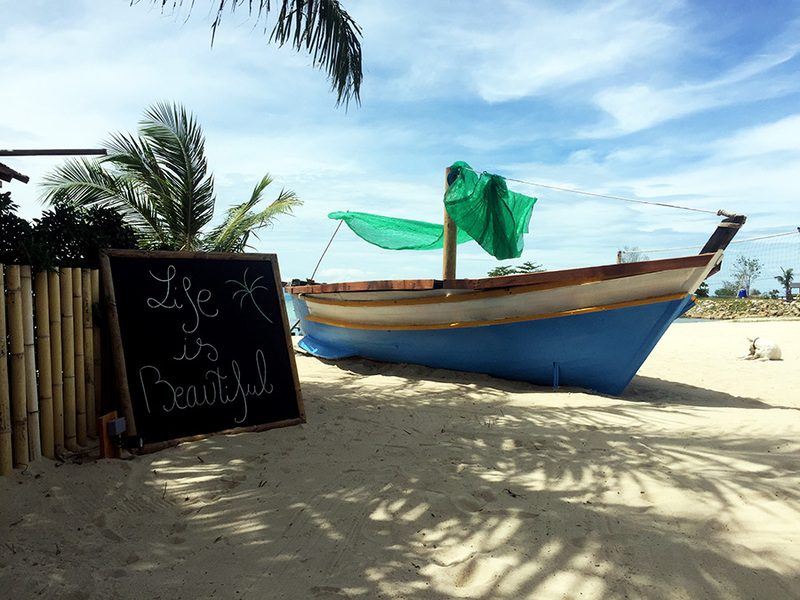 Welcome to paradise on Earth, Koh Tao is an incredibly stunning little island (and my personal favourite). Here is where you can find the cheapest diving in the world. It really has an island vibe where everyone is friendly, restaurants line the main beach and you can easily find a cove to yourself for the day. DAY ONE: This will be a travel day. You will need to travel from Chiang Mai to the south, most likely with a layover in Bangkok. I recommend the splurge and taking a flight to Chumphon or Surat Thani where you will then need to get a bus and a ferry. 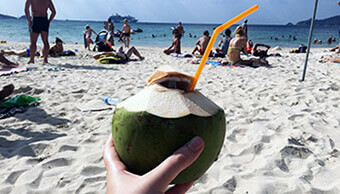 DAY TWO: You’re going to be tired from travel so get ready to kick back and relax on one of Koh Tao’s amazing beaches. Sairee Beach is the main beach where you can catch sunset, eat at one of the many restaurants and find all of the dive shops between souvenier shops. For the afternoon jump on a boat taxi and head to Koh Nang Yuan, the only 3 islands in the world to be connected by sand. Only do this if it’s not included in a snorkelling tour! DAY THREE: Spend a day diving or if you’re getting cerifited you’ll be diving for a few days! Or take a snorkelling day trip where you’ll get to see some of the beautiful coves around the island. Some tours will even include visiting Koh Nang Yuan. This night you’ll need to get ready to party on one of Thailand’s best nights out. The Koh Tao Pub Crawl is famous and is a bucket list thing to do in Thailand! DAY FOUR: Get exploring! Rent a scooter and head to my favourite spot in all of Thailand for an epic viewpoint. Freedom Beach viewpoint won’t disappoint and you’ll probably have the place to yourself as it isn’t yet one of those Thailand tourist places. After taking in the views find your way to a little cove for an afternoon of chilling in the sun. Ask the locals for their favourite before you go, they know what’s best. How to get from Koh Tao to Koh Phangan. Koh Phangan is one of those places in Thailand that is great for all types of travellers. Koh Phangan is famous for its full moon party’s, it’s basically a right of passage in Thailand. But if you’re not there for the full moon don’t fret, there are still plenty of other parties going on and lots to do on the island! DAY ONE: Go see some waterfalls! Rent a scooter and make your way around the island to some of the best waterfalls including Sramanora waterfalls, Phaeng, Thaan Prapaad, Thaan Sadet, Wangsai, Paradise and Thaan Prawes waterfalls. Be forwarned that a lot of the waterfals dry up in the dry season. If that’s the case then head to the Infinity Beach Club Hostel and enjoy the luxurious side of island life without spending too much. Lastly, spend the evening partying at whatever party is on or at the Thong Sala night market. 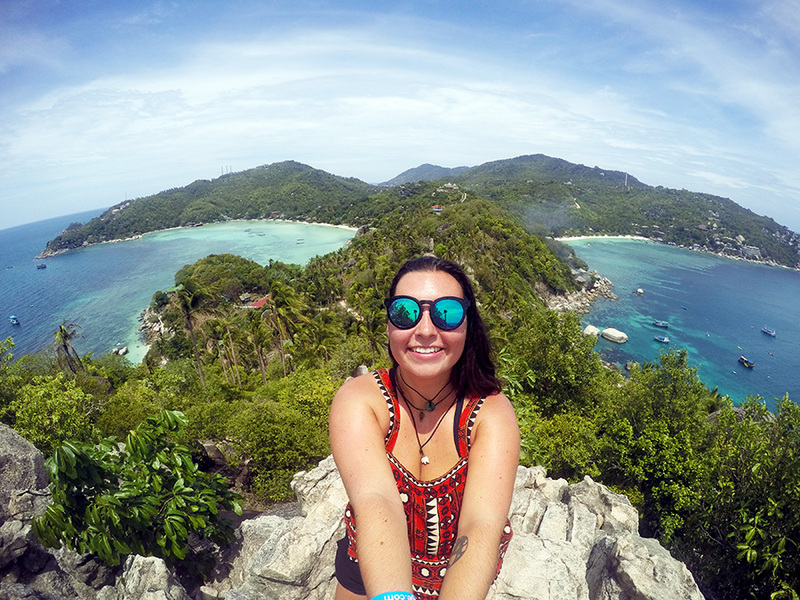 DAY TWO: Spend the day beach hopping and see what Koh Phangan has to offer. Some of the best beaches are Bottle Beach, Haad Salad and Haad Yao (long beach). It is not recommended to try and find Bottle Beach by scooter and instead to go by boat. In the evening head to a party or check out the amazing sunset view from Amsterdam Bar. 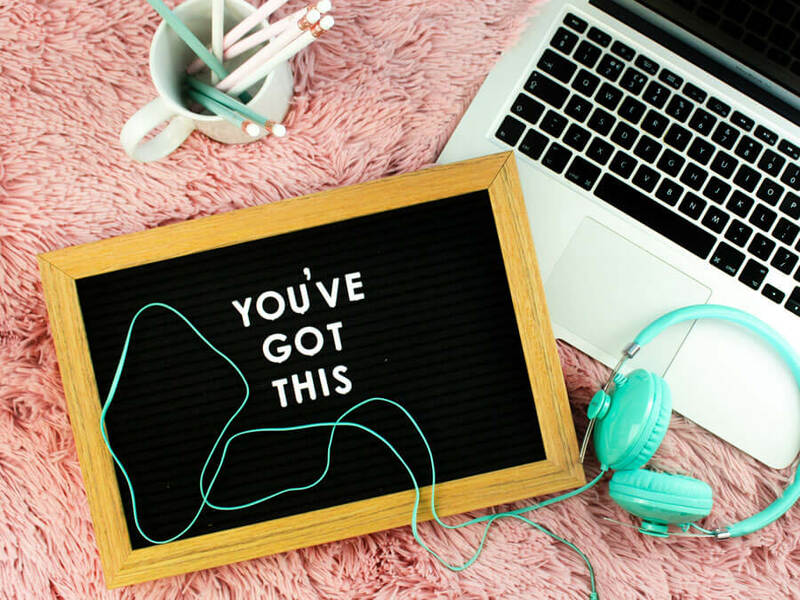 DAY THREE: Your last day is up to you! Try some hiking, head to the Phangan Challenge, a waterpark obstacle course or go diving. Or just spend the day at the beach again if you’re hungover! This is a pretty chill day so if you’d rather get a head start on Koh Samui take the afternoon ferry over. How to get from Koh Phangan to Koh Samui. 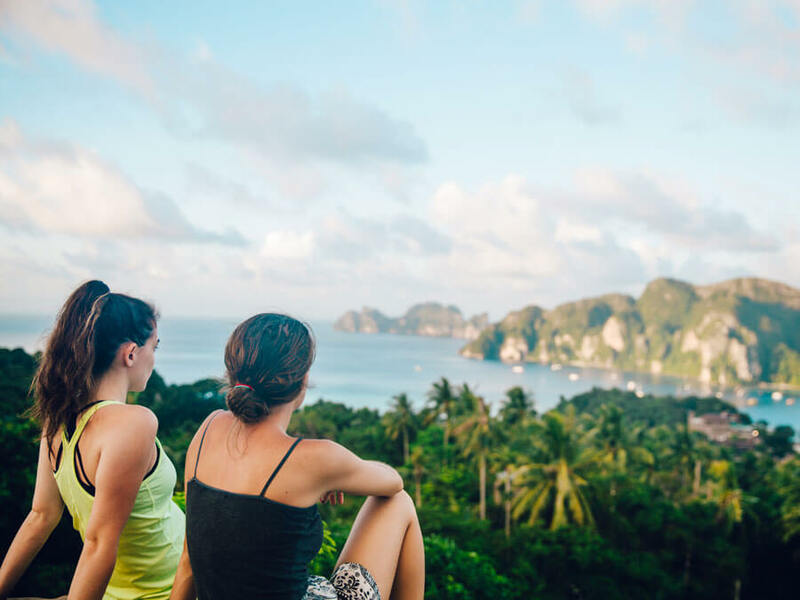 Top things to do in Thailand: a yoga retreat. Koh Samui is the second largest island in Thailand and it can easily take 3-4 hours to get to some spots on the Thailand. It is popular for families and also has some interesting spots to see. If yoga is your thing I highly recommend booking yourself into a yoga retreat. You can thank me later because I know it will be the best ending to your trip. My personal recommendation is Vikasa, it is like heaven. DAY ONE: Get out and explore! Koh Samui has so much to see. Some temples are Big Budda temple, Buddha footprints and Hin Lad Waterfall temple. I’d ask the staff at your accommodation for recommendations as to what is closest since the island is so large. If you’re interested, stop by Hin Ta and Hin Yai Rocks. They’re special because they’re shaped like male and female genitalia. 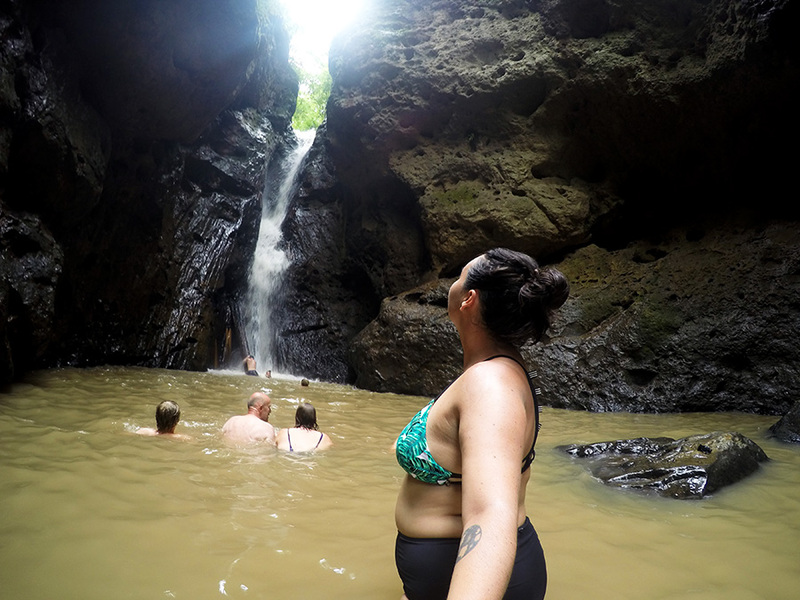 Don’t forget to try and fit in some beaches and waterfalls! DAY TWO: Do a day tour to Ang Thong Marine Park where you’ll get to see a viewpoint over an emerald coloured lake and other islands. You’ll spend the day snorkelling and kayaking through caves. Spend your last night at a Thai market where you can pick up some souveniers and binge on all the Thai foods. Some to checkout are Fisherman’s Village Walking Street, Chaweng Night Market and Lamai Night Plaza. DAY THREE: Spend your morning lounging on the beach and the afternoon making your way to your next destination. 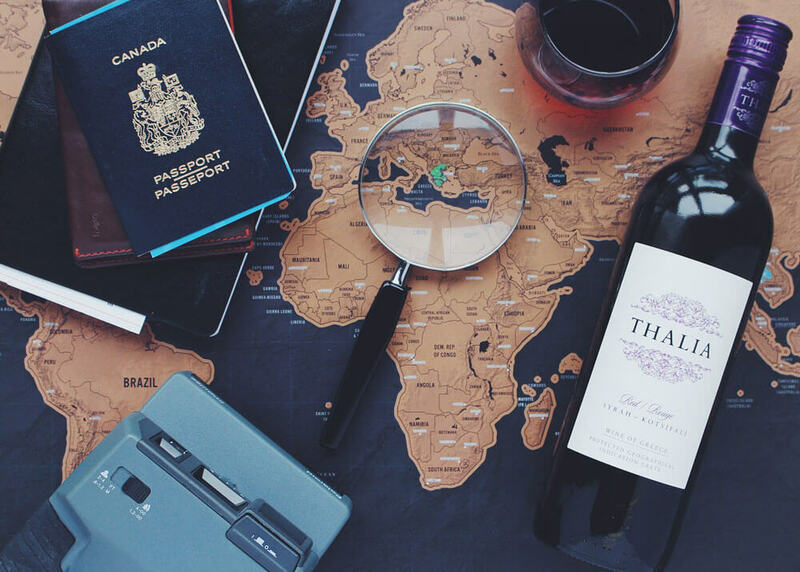 Where to travel in Thailand that’s off the beaten path? Koh Chang! Koh Chang is an island that is more off the beaten path so a stay here is all about relaxation and nature, maybe a party or two and some hiking through the jungle. DAY ONE: First things first you need to check out White Sand Beach (Haad Sai Khao) where all of the action is. In the afternoon make your way up Salak Phet, the highest mountain on the island for the best views and to spend some time in the jungle. It is possible to get up by tuk-tuk if you’re not up for the difficult hike or you can hire a guide for the day to help you through the locals paths. An easier hike that is free is to Kai Bae Waterfall that doesn’t require a guide. DAY TWO: On day two it’s time to see the incredible marine life, colourful fish and coral reefs. Book yourself on a day tour. Most depart from Bang Bao. In the evening make your way to Lonely Beach for a night of partying on the beach, the main party area on the island. DAY THREE: You deserve a relaxed day so spend the morning exploring the Bang Bao floating village and the afternoon relaxing in the area. You could also opt to head to the even more secluded Hat Sat Noi beach. Grab dinner at the White Sands Beach night market. DAY FOUR: Day four you can make a combination of relaxing at one of the beaches mentioned above or doing another hike to a different waterfall. Or both! Find out how to get to Koh Chang. In Phuket you’ll find some of the best beaches in Thailand. 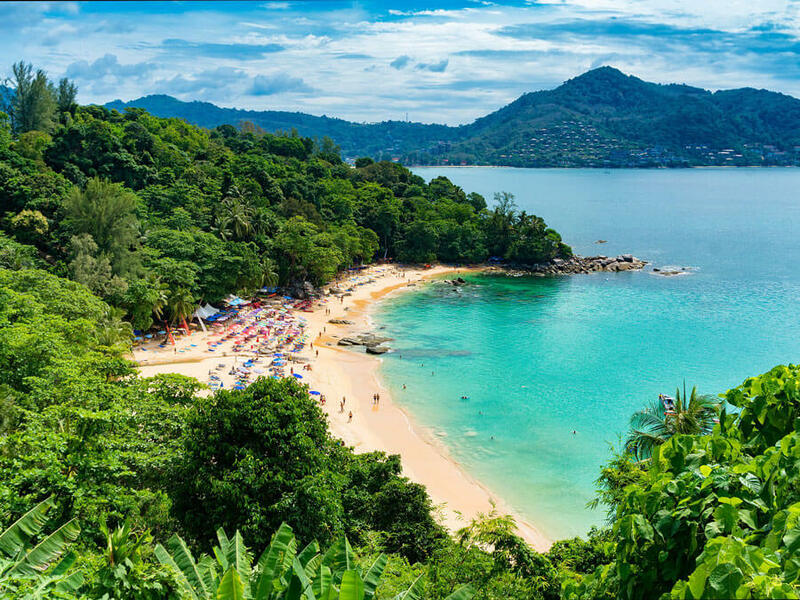 Phuket is ideal for any type of traveller as everything is offered here from epic parties to quiet beaches, shopping and lots of entertainment. DAY ONE: Get around the island to see some of the top sites and culture. Visit the Big Buddha, see What Chalong, go inland to Phuket Town and see the night market. DAY TWO: Time for a day trip! You have a few options: the Similan Islands which are known for their beauty, crystal clear waters and snorkelling, Phang Nha Bay (you’ll see James Bond Island here) which has limestone cliffs and tours usually have kayaking or take a tour of some of the Phi Phi Islands. 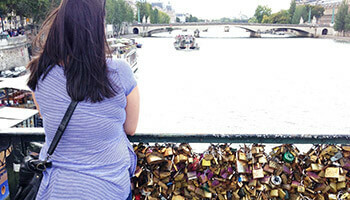 DAY THREE: Do a second of the day tours mentioned above or take time to relax on the beaches or at beach clubs. For the evening go to a show such as Phuket FantaSea or Simon Cabaret. 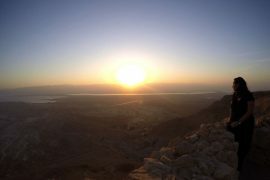 DAY FOUR: Take the morning to hike to a viewpoint before the heat becomes too much. Take the afternoon for more beach time or shopping. Find out how to get to Phuket. 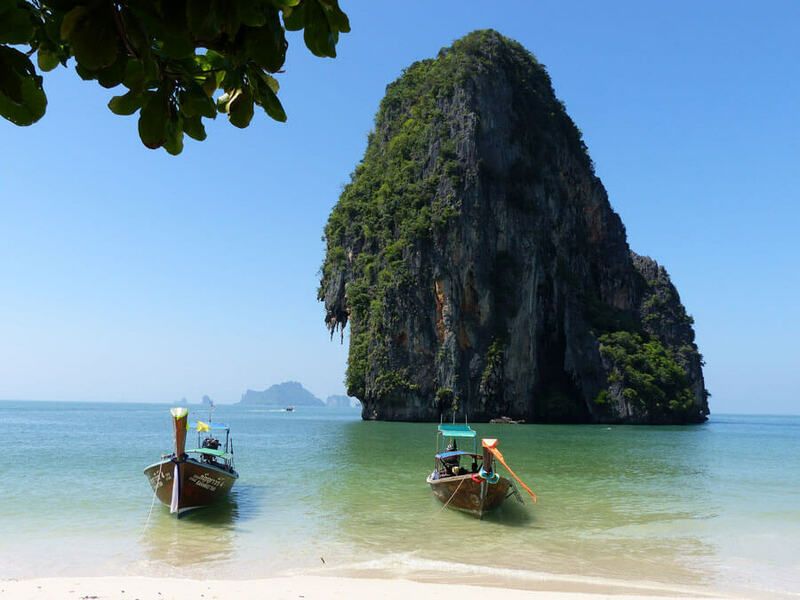 Krabi is one of the best places to visit in Thailand if you love outdoor activities. The more relaxed and less busy option to Phuket, Krabi has a ton of islands waiting for you to explore. You could easily spend a week in Krabi. Since you can spend so long in Krabi I will just recommend a few places to visit such as Railay, Tonsai, Ao Thalane, Krabi Town/Ao Nang and many, many islands for island hopping! Find out how to get to Krabi. Don’t miss the Phi Phi islands on your visit to Thailand. Koh Phi Phi is very popular as a day trip from Krabi or Phuket but if you choose to spend longer on one of these quieter islands then here is what you can get up to. 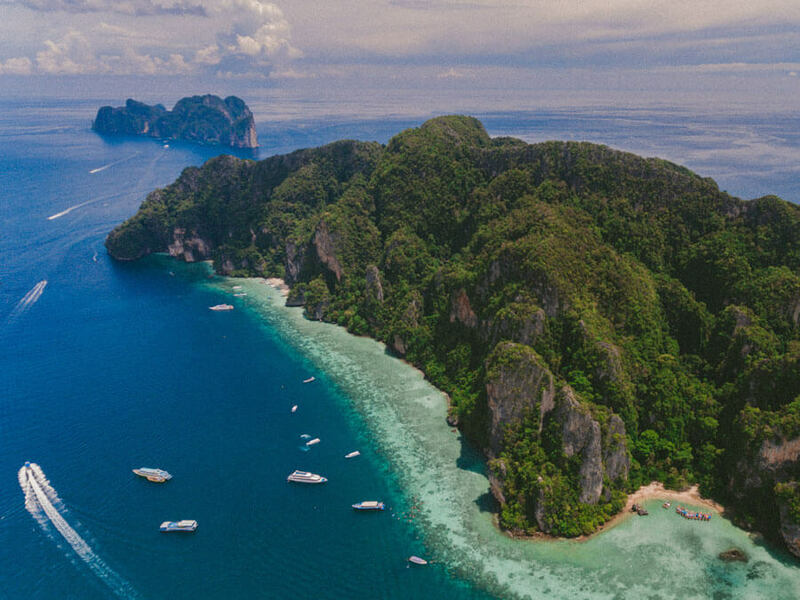 DAY ONE: Visit Koh Phi Phi as a day trip from Krabi (or Phuket), an itinerary will be made for you by a tour company bringing you to lovely islands. DAY TWO: Hike up to the Phi Phi viewpoint, take a cooking class and spend some time at Moo Dee Bay. DAY THREE: Check out what’s underwater for a day of diving, go rock climbing, hop on shark spotting tour or visit Viking Cave. Find out how to get to Phi Phi Don. Thailand sightseeing is spectacular in Koh Lanta. Get ready to rent a scooter to explore this island and take trips to other islands to spot emerald green waters. Koh Lanta is more chilled but still packed with plenty to do. DAY ONE: Go snorkelling at Koh Rok, often referred to as one of the best places to snorkel in Thailand. DAY TWO: Spend the day exploring Lanta Old Town, take the time to walk some dogs (who wouldn’t want to do this?) and spend the evening at a chilled out bar. DAY THREE: Explore the national park by motorbike. You’ll spend the day stopping by epic viewpoints. There are hiking trails and even a lighthouse to explore. DAY FOUR: Time for another day tour, hop on the 4 islands tour to see even more beauty and amazing waters that you can jump into. DAY FIVE: Check out the beaches, do some yoga, explore an area that you loved more or go diving. Find out how to get to Koh Lanta. 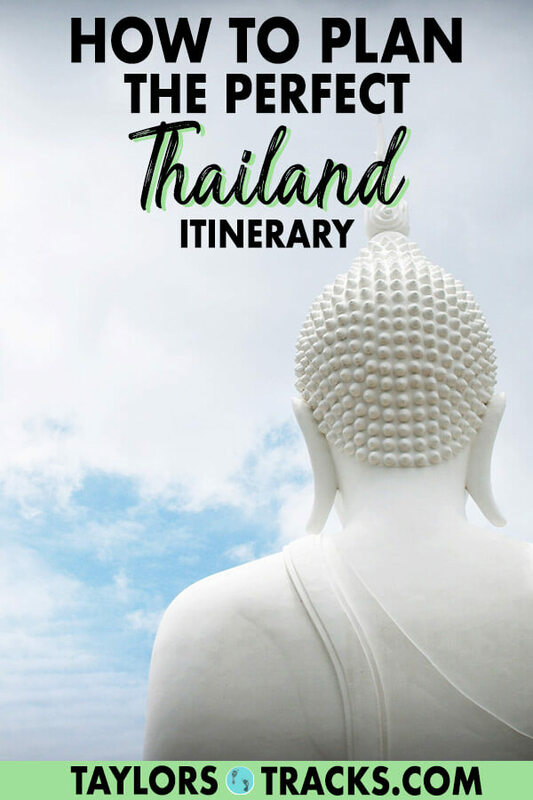 I hope you visit Thailand and enjoy it as much as I have and that this Thailand trip planner was helpful!